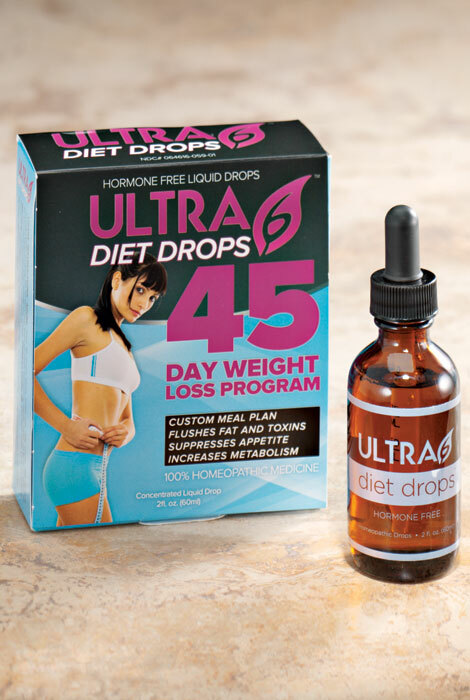 Ultra 6™ Diet Drops taken before meals promote weight loss—up to 2 lbs. a day—by suppressing appetite in combination with a 1,000-calorie-a-day diet. Manufactured at an FDA-approved facility. USA. One bottle of weight loss drops is a 45-day supply. *These statements have not been evaluated by Food and Drug Administration. This product is not intended to diagnose, treat, cure or prevent any disease. Take just 10 drops before each meal, follow our approved foods list, and watch those pounds melt away. Nothing else has worked... I have lost 4 lbs in 3 days with this. I want to purchase this for my son who needs to lose over 100 lbs. This exactly what i wanted to buy to loose waight. I have used the Hcg diet before and found it to be a great kick start to any dieting regime. If you follow the instructions and stick to the food allowances it is a great way to monitor your food intake and caloric intake for the day. The drops really are a boost to you diet and I highly recommend them. The ingredients looked great for the price. I have used another brand and had good results, so Why not try this one? To see how effective it is does it really work. and decided what do I have to lose,either the weight or 81.00 dollars S/H included. Interested in seeing how it works. I want to loss weight. Have used thes kind of drops before and they work. need to lose some wt so going to use them again. Tried every diet so far. Have high blood pressure and high cholesterol, and need to lose weight. BEST ANSWER: Thank you for your question. We have included below the instructions for this item.We hope this information will be of help to you.